I’m a creature of habit. If I have recipes for every possible occasion, I don’t feel the need to develop a new one! I was good with the gluten-free sourdough biscuit recipe I shared last summer. Everyone around here loves it. However, it uses sorghum flour, and the supplier I buy that flour through has been out of stock for several months. My own supply is down to just a few cups, and I want to save it for bread. So what do you do when the family wants biscuits? Yeah, we throw some ingredients together at bedtime, and figure whatever mess we find in the morning will be edible. We could live with drop biscuits. My kids are really not picky. Except… that lovely mess I found the next morning? and the results were easy to duplicate. So, are you gluten-free sourdough lovers ready for a super easy biscuit recipe that you likely already have all the ingredients to make? 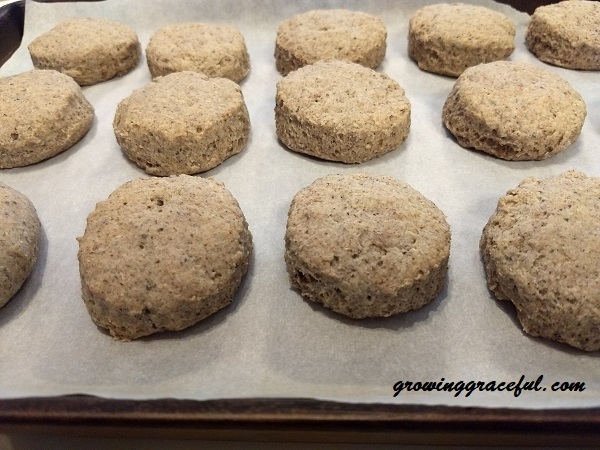 You can download the PDF, Buckwheat Oatie Biscuits; A Gluten-Free Sourdough Recipe, HERE. Cut butter into the flour and chia seed mixture until it makes a crumbly meal. Stir in starter and water. Combine well and cover. Leave to sour for 7 + hours. Preheat oven to 425 degrees. Line baking pan with parchment paper. Add salt and baking soda to your dough and knead in thoroughly. Turn out on counter and roll to desired thickness. Cut out biscuits and place on your baking pan. Bake for 12-15 minutes. Remove and allow to rest for 5-10 minutes before slicing. 🙂 Thanks, Lynn! Have a WONDERFUL weekend!! I am no longer an Amazon Affiliate. I will continue to include links I feel will be helpful to you, but will make no commisions off products you buy through my links. Thank you for reading my blog! !